Whilst the importance of top of the range consumables is essential to the overall quality of your print outs should not be overlooked, there are some very impressive alternatives to the brand name goods on the market right now, including this item. 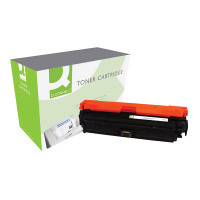 A fine example of the many benefits that the Q-Connect range has to offer, this toner is hardwearing and comes in a generous volume for good measure. This item is suitable for HP Color LaserJet CP5525. This item prints up to 13,500 pages.